Moonlighting was a 60 minute detective comedy series on ABC about a highly successful fashion model whose investment manager took off to South America with all of her money. She was left with only a house and an unprofitable detective agency. After initially deciding to sell the agency to raise much needed cash, the only working detective at the agency somehow talked her into coming on board as the new boss. The plotlines centered around Maddie's ability (or inability) to deal with the scum that they had to deal with like thieves, cheating husbands, embezzlers, etc. The obvious animal attraction between Maddie and David was also a main theme. Have you ever loved a series where the main female and male characters seemed perfect for each other but never quite "made a move"? That's a pretty common theme and one that worked great with David Addison and Maddie Hayes on Moonlighting! The reason that most potential TV couples remain "potential couples" is that audiences seem to love it. If the couple ever does get together, it tends to be very close to the end of the series. Moonlighting is a perfect example of why such couples rarely hook up in the middle of a series. The show was still doing fairly well at the end of the fourth season. At the beginning of the fifth season, viewership fell off dramatically and the series was not renewed for a sixth season. ABC hired producer Glenn Gordon right out from under NBC's nose! Glenn abruptly left "Remington Steele" and came onboard as Moonlighting's producer. Moonlighting's cast crew just couldn't seem to get episodes "in the can" on a timely basis. Just look at the air dates below to see what I mean. Many of the weeks with no Moonlighting episode were caused by writing delays but, to be fair, Cybill Sheperd also had to take time off due to a real-life pregnancy and Bruce Willis had to heal a broken collarbone that he got in a skiing mishap. The accumulated delays were so bad, however, that ABC actually ran a promotional ad for Moonlighting that featured an ABC employee anxiously waiting for the next episode to arrive! They may say that "the early bird catches the worm" but that sure wasn't true for Bruce Willis and Moonlighting. Nearly 3,000 actors tried out for the role of David Addison and Bruce Willis was the very last one! It was a great break for Willis as Moonlighting was his break from struggling actor to what would eventually become super-stardom! Cybill Shepherd was actually the more established star when Moonlighting began. She had already starred on a series titled, "The Yellow Rose" and had also racked up a decent number of TV and theatrical movie credits. After Moonlighting, Bruce Willis would concentrate on a theatrical movie career while Cybill would star in a number of TV movies. Then, in 1995 she did what few other actors have managed to accomplish! She got her own "named" series titled, "Cybill" which ran for a very respectable 4 seasons and 87 episodes! At the time of this writing (2008) Cybill is still a star and most recently moving more into theatrical films. She also joined the cast of the Showtime hit series, "The L Word" for its fourth and fifth seasons so far! Before Maddie got personally involved in running the detective agency, it was named, "City Angels". Maddie didn't like the name and changed it to "Blue Moon". The scripts on Moonlighting were often 2 or 3 times as long as a typical show due to Dave and Maddie's tendencies to "talk over" each other. 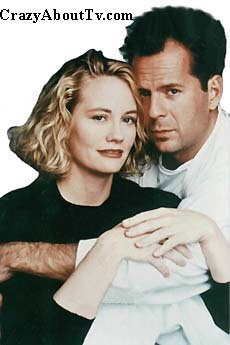 Moonlighting was one of the few series to break one of the golden rules of television show production. Cast would often look into the camera and talk personaly to the audience! Usually they'd be commenting about something that the writers had put in the script but they would also talk about the producers, directors, or something else. The most extreme case of this was in the very last episode titled, "Lunar Eclipse"! Maddie and David were returning from a wedding when they saw crew members hauling away the Blue Moon sets. There was also an ABC executive there to notify them that Moonlighting had been canceled! Thank you for visiting our Moonlighting page!